The technology of digital publishing and print-on-demand makes it possible for us to make our books available. It's also made marketing books even more competitive. Fewer than 20 percent of books listed in Publisher's Weekly's program for independent publishers ever get reviewed. We're grateful for the review we received. For the uninitiated, mental illness can be confusing, vexing, and even terrifying. 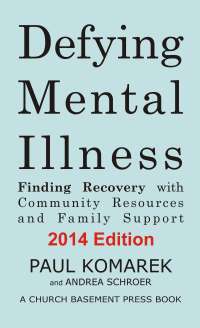 Komarek and Schroer present educational and resource material for people suffering from psychiatric maladies and those supporting them. In basic terms and scope, the authors seek to demystify mental illness. Chapters on recognizing symptoms and managing disorders, as well as treatments for both adults and children are enhanced with case histories and quotes from people who lucidly recount experiences with such maladies as bipolar disorder and schizophrenia. Readers would be wise to recognize that Komarek and Schroer are not clinical professionals, but teachers with compassionate and enthusiastic intentions. And while their approach to and perspectives on mental illness are well-meaning, readers who find themselves (or a family member) in the throes of a psychiatric condition would be wise to seek the advice of professionals before diagnosing or treating their own symptoms. This book is mainly a useful primer for those looking to understand mental illness. Here's the link to Publisher's Weekly's full coverage of independently published works.